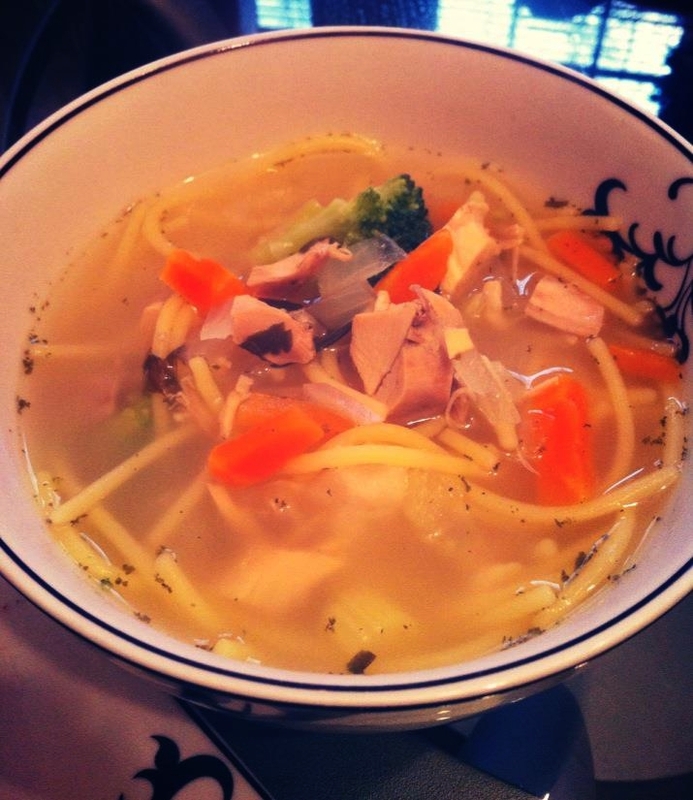 Chicken Soup, Bone Broths, Veggie Broths - Mineral Rich Liquids That Heal! I put this together for my Yoga School friends and thought - what they heck; I'll throw it on the blog too! :) Below are my recipes for making bone broth, veggie broth and my chicken soup:) Enjoy! Seek out the best quality chicken, beef or whatever meat you intend to make broth from. You can get antibiotic/hormone free chicken, grass fed beef, and animals that have been raised in more humane ways if you look for it. Check Whole Foods, Foods For Living, Better Health and ask questions about how the animals are raised. If they don't have answers, call the farm. Chickens should have room to roam around outside so they can eat bugs and worms. This makes for a healthy bird and healthier meat. Bake chicken with the bone in (or an entire chicken). The idea is that you want leftover meat, so you can use that for your soup. I like to bake my chicken with butter, rosemary, oregano, garlic, whatever strikes my fancy. Bake at 350º for one hour, cover the glass pan with tinfoil. Broil for 5 minutes at the end to brown the skin for fun. I like to make bone broth with the bones that remain; this is how I make such yummy soups. (Of course the vegan ones I make are made with vegetable broth only.) See below for the veggie broth instructions. Bone broth is delicious and provides needed nutrients to heal our often problematic guts, healing digestive woes, autoimmune problems and much more. It’s rich in amino acids and healthy fats that support our ligaments and all connective tissue. Bone broth is super easy to make. One of the most important benefit of any broth - be it bone broth or just a good homemade vegetable broth is natural and organic sodium. This is one of the best healing nutrients for the stomach and intestines. Minerals Up... Dis-Ease Down! Drinking bone broths daily to heal the lining of the gut for allergies, autoimmune conditions, or debilitating illness is strongly recommended. It helps you heal faster! As far as the chicken bones - just take the carcass and throw it in a sauce pan covering it with purified water. (clean water is SO important) if you need info on how to get reverse osmosis water talk to me:) I’m passionate about this subject. Add a tbsp of Apple Cider Vinegar to the water and begin simmering on low. Let it simmer for 24 hours, check the water level to make sure that it never runs low. Bones should always be covered. Continue simmering. At about 12-18 hours, your chicken bones are likely ready! Time to strain the bones and debris. Use a fine mesh strainer and strain. A canning funnel is also helpful. Throw out the bones etc and can the broth in glass - or begin your soup immediately. Canning just means putting the strained broth in Ball jars, lidding them, letting them cool, and then putting them in the fridge. Keeps two weeks. In this soup I added gluten free noodles. These are the quinoa/corn blend noodles by Ancient Harvest. I prepare them alone and then add them cooked to the soup. They are amazing! 1 quart purified water (a little more or less may be needed. 1 breast of chicken sliced (deboned) Hormone Antibiotic Free Chicken locally sourced is best. 2 tbsp crushed rosemary (rosemary and all herbs should have nice green color and should have a good aroma when crushed between the fingers; aromatic herbs are potent medicine. 1 tbsp oregano leaves - again, green, aromatic leaves are important! Combine 2 quart purified water, 1 large chopped onion, 3 stalks chopped celery, chopped garlic, 1 tbsp crushed rosemary, 3 chopped carrots and simmer on low for 4 hours. May be cooked on low in a crock pot all day long. Lightly salt - just a sprinkle to start. About a half hour to an hour before serving, I like to add the frozen veggies (½-whole bag) just an hour or two before canning or serving the soup. I don’t like them to be too over-cooked because they lose their color. Of course if you want to chop up fresh broccoli, do that! I like to salt the soup to taste at this time. Just a little at a time will make it yummy without being too salty. At this point, the soup should be a really nice consistency. Not too runny, not to thick. IF YOUR SOUP OS RUNNY: Thicken up by adding cooked quinoa, a bit of organic cornstarch wisked in water, or by adding a quarter cup of Nutritional Yeast. I like to can my soups so that they can be eaten throughout the week. Just use pint jars for servings for 1 - or quart jars for family size soup eating. Can them in clean ball jars, with the metal rings and lids - allow to cool on the counter for a few hours. Then put them in the fridge. Keeps about 2 weeks. Soup may be frozen by filling to the FREEZE LINE about 1 inch from the top of a Ball jar. Other great herbs - basil or thyme as long as they are green and aromatic. Combine all ingredient in a pan in 2 quarts of purified water and simmer 12 hours or over-night. Your house will smell amazing and your broth will be amazing-er! This can be the basis for any soup, quinoa, chili, gluten free soups or “can” it if you like as I mentioned for later use. You can also use this broth to make rice or quinoa side dishes for dinner. Makes everything taste so much better because minerals taste delicious and add to our health with every bite! As you can see, all the preparation is the extra ingredient - LOVE!